Gil and Kelly Bates responded to Access Hollywood's request for a statement regarding the recent attention that the Duggars have received by the media. "We are praying for our dear friends," said Gil and Kelly. "We respect their privacy and have no further comment at this time." Gil and Kelly Bates and their 19 children star in Bringing Up Bates, a reality TV series that airs on UP TV. 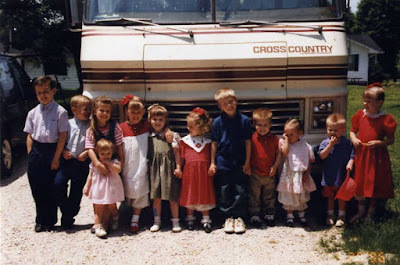 The Bates and Duggar families have been close friends since their oldest children were four feet tall (see picture below). We all should be too. It's all in God's hands. No amount of crying or anger will help anything! Fervent prayer and the ability to say Thy will be done is the best thing we can do. Even boycotting TLC & the companies that pulled funding for the show isn't enough. There is so much hatred towards Christian families that it's sickening to read the many articles on the web. Most of these nay sayers will probably buy more stuff from them as a big thank you! Prayer and faith is our greatest weapon! Placing the Duggar family in God's very capable hands is what we should be doing. Allow the Lord to bring them through this witch hunt. I put my faith and trust in Him. I agree with the Bates. I think what the Duggars need right now is prayer and privacy. As much as I enjoy the show, I would rather only get updates from this blog so they can get out of the public eye while they deal with this as a family. More exposure is not going to "clear things up" for the Duggars. They are being willfully misunderstood and misconstrued by the public. They stand for the Lord and as long as they do that this world will stand against them. (John 15:19) My biggest concern in all this is for the girls. The speculation is not going to just stop. Every event in their lives that brings publicity will be tainted with rude comments and innuendo. The girls living at home don't have a choice, but I hope Derrick and Ben stand up for the privacy of their wives and families. I would rather give up my desire for entertainment than see this poor family dragged through the mud again. What else could this family say about the Duggar matter? They also are under contract with UP network...they have to keep clear of this for their own TV image. We don't know whether or not Kelly and Michelle have been speaking over the phone or not.....and we won't know either. I can understand they want keep their privacy. In other words they are minding their business! Which is what I wish those people who broke this story would have done! It was a family issue... I adore the show and have no interest what children did 12 years ago! What I would like to see is the show put back on. No other show would bring me to tears of joy almost every single episode. There are no shows like that on TV now. It's such a shame. Amen! Diddo to that response. I have found my way back to God as a result of watching this wonderful family. Lord, you are my strength and my protection, my safe place in times of trouble (Jeremiah 16:19, NIV). Keep praying and keep your heads high, it shall pass also. God Bless your whole family, Anna I pray your delivery will go smoothly and you will feel God's peace. Can't wait to see the new little one. Good for the Bates family! Please, New Media, lets not ruin another good show! For those that continue saying UP should add 19 kids and counting to their line-up; that more than likely will not happen. Stephen Collins (the Dad from Seventh Heaven), also got into a mess similar to Josh Duggar's. When news of that broke, Seventh Heaven was dropped from UP'S line-up. I've posted this comment several times and it is yet to be posted, I sincerely hope Lilly and Ellie post it, as my comment is neither profane, insulting, derogatory, nor in poor taste. I read the comment about Stephen Collins tonight, so it was posted, but I'm not sure if it was your comment. I hadn't heard about him or 7th Heaven being dropped. I do enjoy the Bates family. They seem to really love the Lord & I believe they are standing with the Duggars in prayer. The problem here is Stephen Collins was a grown man, an ADULT, not a 14 year old under aged boy! What Josh did was clearly wrong but by no means does their family or anyone affiliated deserve the unforgiving backlash. The parents tried to deal with it to the best of their ability and I respect all of them for it. They are still a good example of what family and children should be. I will take the Duggar's and Bates over a lot of the unguided children I see today. I pray they lean on their faith and a loving God to pull them through. also stephen collins was an adult and josh was a minor when this happened. sorry for multiple comments but my phone was freaking out and would stop letting me write. While watching the Bates show, which I love, I began to notice that it seems like they have a lot more kids than the Duggars, even though they both have 19, but then I realized the difference is that the Bates interact with the older boys a lot more than the Duggars do, and generally mingle and talk with all the kids in all their activities. Many have commented that we rarely see all the older and middle Duggar boys. In their contemplation about what happened with Josh, the Duggars will be wise to think about how Josh might have needed more warmth and attention as a pre teen and teenager. also, while Gil is affectionate with Kelly, he is not as constantly kissing and hugging her in front of the teens as We have all gotten used to seeing from Jim Bob. I hope that Jim Bob and Michelle consider these on this difficult journey. Good observation! I have noticed that about the Bates family as well. The parents are much more hands on and interactive with their kids than the Duggars. Also, the Bates family is more open to career choices and options for their children. For example, Erin Bates met her husband while working for a Christian ministry. Kelly and Gil Bates met each other in college. So far only one Duggar child (male) has been allowed to attend college. I was under the impression that the Duggar kids (homeschool grads, GED) do get a college education...online at home. Darling picture! What would any of us do without our dear friends to help us along through the good times as well as the tough times. So Good that someone is still with the Duggars! I am trying not to give up on this but this has gone on long enough! We need to do something! And I can't do anything because I am only 11! So if you think you've found a way to help please do it because that family is at stake! You can do something for them no matter how old you are. You can pray for them. God loves all his children equally, and listens to all of their prayers. Love your show. And congratulation's on the growing family. Blessings to you and your family members. God is so great. Interesting it took so long to comment. Certainly a lot is said in those few words. I pray for the Duggar's as well, especially the victims. I pray for Josh and the the way his parent's handled this horrible event. I certainly hope a Bate's girl was not involved. I am counting on the Bates Family to not let me down and that no crimes committed come out about them. Awkward situation for the Bates. Well that doesn't say much does it. I'd say the Bates appear to be distancing themselves from the entire mess. They probably want nothing to do with the bad press. Can't say I blame them. The Bates family doesn't need to get involved in the Duggar mess. The Bates kept it neutral and classy. Love them. Oh my goodness! How cute they were! I agree with the Bates that the Duggar privacy needs to be respected. Why in the world does Access Hollywood want a statement? It would seem to me that a Christian family would be positively boring to Hollywood. The world is watching Christians. When someone "falls" and it is someone who is a "famous" Christian or Christian family they jump on it....they say "we knew it, all Christians are hypocrites". Wish josh would speak. Sisters as well. Keep The Faith Duggars! This too Shall Pass..Whoever has no sin cast the first stone! One more thing, you are a wonderful family, just not a perfect one. God Bless! Wish I had UP television but I don't I would love to see the Bates' in their show. Prayers to the Duggar family!! The Bateses have class and dignity; their statement demonstrates it perfectly. Praying for you, Duggar family! I've watched every single episode and am continually blessed by your family. I have learned so much from Michelle and the older girls. Your gentleness, honesty and perseverance are testimonies to your faith. You are strong because our Savior is strong. Thank you for being such a good example to so many. Continuing to pray for ALL those that have been affected both here and around the world, family, friends and the viewers like me who feel like we are part of one big family in Christ! Two sweet families! I'm praying for the Duggars as well. Yes, the Bates family was on TLC briefly. Wish they would come back, as I don't get UP! Channel either. Wow. That's all they have to say? Lifelong friends? The duggars built them a house... The duggars got them a television show and that's all? Were praying for them? They are wise....I think behind the scenes they are probably being very supportive to the Duggars......but they are wise to leave themselves and their family out of this mess. Shame on you. Why should they say anything? This nothing to do with the Bates family. They are taking a very respectful approach and staying clear of this mess. I love 19 kids and counting! It is a great happy fun filled show. TLC should leave it on the air. The Duggers are good people and should not have to relive an event that happened over 10 years ago! Leave them on the air, please! perfect comment it really is none of our business. It has been in the Lords hands. Prayers sent for strength. I know it's hard being in the public eye. I don't want it. But I'm very grateful to watch this show. It has taught me to be a better MOM. Michelle and Jim Bob are very great parents. I love both Duggar and Bates families. Such true and loving people of God. Nice to see the Bates' are sticking by their friends.God bless you all. Wise choice to not give Hollywood or any other secular media outlet something to distort. That's the best thing they could have said! People would've started criticizing them if they show any support. I love both of these families and my heart hurts for the whole Duggar family. Keeping them in my prayers. TLC is not the only media outlet in the world. The Duggars have ministered to millions world-wide. Since TLC and all of their fair-weather sponsors have dropped them, the Duggars are now free to do ministry as never before. UP TV is an option but; perhaps, the Duggars should produce their own show and put it online. If they do, we need to support them financially. I love the Duggar and Bates family!! I pray for the Duggars and support them!! @Marlene Young -- Brilliant comment! I think that what happened in the past is past. God forgives and has forgiven Josh, why bring this up, and what good will it do? Christians need to stay out of the lime light, because non-christians love to attack any and everything christians do. Prayers need to go up for the family and for healing. We love and support the duggar family. I am sure the Bates are concerned about the times the families spent together. My first thought would be about the welfare of my daughters. @Anonymous#1 -- YES, there is a lot of hatred towards Christians out there, particularly on the internet, as I read comments. However, I'm afraid this incident has only done more to fuel their fire and given them justification. Given Josh's hidden past (yes a minor, but at an age where in many states he could be tried as an adult), he was definitely not the right spokesman for "family values." I believe he used poor judgment in taking that FRC job, and in doing so he has tarnished the FRC and Christians, in general, in the eyes of many who seek reasons to smear us. I hope this comment is posted, because I believe it meets the comment guidelines, and I think this point needs to be acknowledged by Christians. We as Christians need to be up front about our failings and take the logs out of our own eyes before demanding that others take the speck out of theirs. We don't need to be telling people how to live their lives -- let God convict them. Let's just tell them about God's love and redeeming grace. I'm praying for the Duggars, that God will give them the right words to say during their interviews, and that their words and hearts will be heard. @anonymous 34 have you heard before that 'less is more'? They said little but it spoke volumes. Prayer is powerful and that in itself is a lot! Really what more can they say during this delicate and hard time? Maybe they are considering the victims involved and therefore not commenting out of respect and cosideration. In my opinion, their comment was sufficient and comforting. You are a wonderful family. God bless you for being so loyal to your friends. Both the Duggars' and the Bates' are inspirations to me. You think people are going to let this go! This is vulcher food!! Look at the Kennedy assassination, Bill Cosby. just to name a few. No, if you are famous people are going to hound you , blow every detail they can get there hands on out of per-portion, They judge you like you are already on trial then convict you! Why? Because they are all perfect and they have nothing better to do! Just wait till after the interview tonight! It seems to me that this whole Josh thing is an all-out satanic attack on the Duggars. I agree that the press should be going after those who illegally released the information. To make the Duggar girls go through this is reprehensible. I hope the whole family can feel the prayers we are saying for them and that they feel the strong and loving comfort of the Holy Spirit. I am so sorry for what the Duggar family is going through. It is happening way to much in this world. God bless all of you. I hope you find a way back to television as I miss your show and loved seeing your dedication to God. Really?! I had really hoped UP would give the Duggars a second chance. Everyone deserves one. You are so right. Both Kelly and Gil are wonderful parents and different from the Duggars. I noticed the same things you did. Me too !!!! I had read that Gil is a pastor of a small church. Is that true ? I think Til and Kelly handled the matter well. It does not concern them. The Duggar situation is complicated. I have mixed feelings about all of it. I feel for the victims. So many unanswered questions that will never be answered. And shouldn't be. It's not our business. I Just hope the Duggar parents had handled the situation right. I don't know if they did only the girls know.But I do know, The worse thing for victims is when their feeling aren't first.....but the abuser is protected. How many families hush the abuse and it is all pushed under the rug ? I hope this didn't happen in the Duggars home.